Since the Federal Reserve initiated its third round of quantitative easing (QE3) last week, critics have expressed concern that the policy would ultimately be inflationary. Investors also seemed to sense a higher risk in this area; gold and other commodities have rallied as portfolios seek to hedge against this outcome. In response, several Federal Reserve officials have been out defending the central bank’s action. A word or two on this front is therefore in order. It will be important to keep a close eye on inflation and inflation expectations, as the Fed’s ability to maintain QE3 could eventually be restricted if the price level begins to escalate more rapidly. Our view is that inflation is unlikely to breach the Federal Reserve’s target level of 2% anytime soon, and that expectations will eventually come into line with this. The Fed considers both actual inflation numbers and inflation expectations data in the formulation of monetary policy. The Fed’s preferred measures of current inflation, the overall price index for personal consumption expenditures (PCE) and the core price measure (which excludes food and energy), are both holding below the Fed’s inflation target of 2%. They also show a decelerating trend, consistent with high levels of resource slack in the economy. Essentially, all is well on this front. But it gets a bit tricky as we look forward. Inflation expectations indicate the likely course of inflation in the future and give an advance warning to policy makers. Market-based inflation expectations have posted a noticeable increase since early June, but from a relatively low level. In addition, there have been large fluctuations in inflation expectations in the last two weeks. How is one to interpret these developments? Following is our take on this question, after a short detour to discuss the computation of inflation expectations and a few striking details of recent movements. Following the Fed’s announcement of open-ended easing on September 13, the 5-year breakeven inflation rate increased a total of 27 basis points in a span of only two days to 2.4% before reversing the upward trend. Using these calculations, inflation expectations have ranged between 2.0% and 2.4% in the last ten trading days. 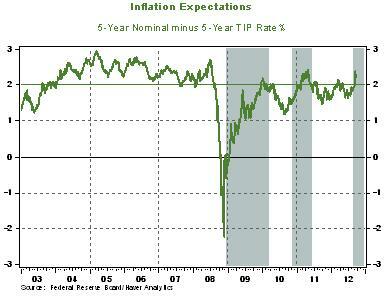 This illustrates a first important point: inflation expectations derived from the TIPS market can be volatile, even though one would expect views on long-term inflation to change only gradually. A second important observation is that inflation expectations have posted large fluctuations after two out of the three rounds of quantitative easing have been announced, only to recede to more non-threatening levels. Note: Shaded regions denote periods of QE1, QE2, and QE3 respectively. The median of the 5-year breakeven rate of inflation during January 2010 –September 2012 is 1.86%, while the median during 2003-2007 was 2.35%. (Quotes of 2008 and 2009 were excluded as data points include historical outliers, given the nature of the crisis.) This reduction of the 5-year median breakeven inflation rate is an important development we will be tracking closely. Nonetheless, recent readings on inflation expectations compare to a low of 1.64% in June 2012. And so the sharp increase of market-based inflation expectations in the last week garnered a good number of comments in the financial press. The consensus has been that expectations of better growth in the US economy, buoyed by the Fed’s action, have resulted in higher inflation expectations. We do not disagree with general tenor of this argument, but one has to be cautious before drawing far-reaching conclusions from a few observations. Given the slack in the US economy and soft global economic conditions, it will be surprising to see outsized increases in the breakeven inflation rate in the months ahead. The importance of the service sector in the US makes inflation very sensitive to wages, which are being held down for the moment by high levels of unemployment. Reflecting this, estimates of expected inflation available from surveys of households and professional forecasters show a stable expected inflation trend and do not suggest an outbreak of worrisome inflation expectations. The Fed has earned a great deal of credibility as inflation has decelerated from the alarming levels of the 1980s to the persistent tame readings in recent years. The economic literature stresses that expectations of inflation can become self-fulfilling, and they must therefore be managed carefully. The Fed has no desire to ruin its hard- earned reputation. In sum, we do not think it will come to that. But the potential for higher inflation at some point in the future remains a risk, and one that must be respected given our recent history.